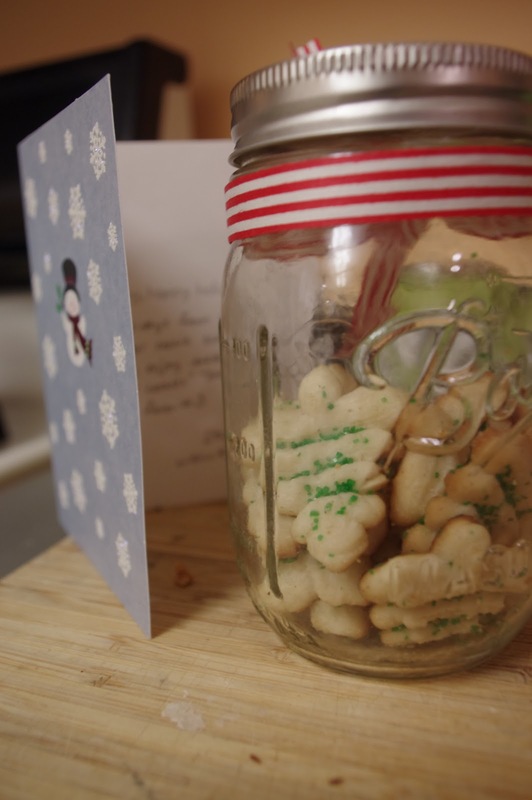 I partook in the 1st annual Great Food Blogger Cookie Swap. I saw a post about it on a fellow Nashville food bloggers, Lindsay and Taylor of loveandoliveoil.com. They teamed up with Julie of The Little Kitchen to create a huge cookie swap that consisted of 600+ bloggers from around the US and Canada. 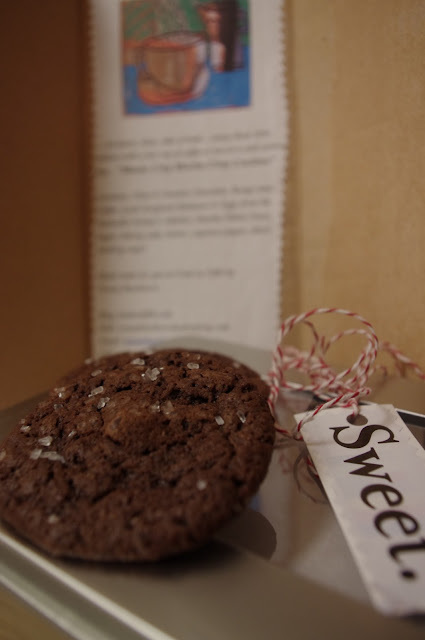 Each blogger got 3 other food blogger's addresses to send them a dozen cookies. I sent cookies to New York, Maryland and Massachusetts. You didn't know what kind of cookies you would receive, or who/where they would be from. I received some pretty awesome cookies, like these cream cheese sugar cookies from Steph at Will Run For Treats. And these really yummy and unique Mocha cookies from Teresa at Food On Fifth. These cookies had chocolate, coffee, salt, and cayenne pepper in them, and they were aaaa-mazing. And, Teresa is also from Nashville, and used all local vendor ingredients for her cookies! For my batch of cookies to send out, I decided to make mint chocolate chip cookies. 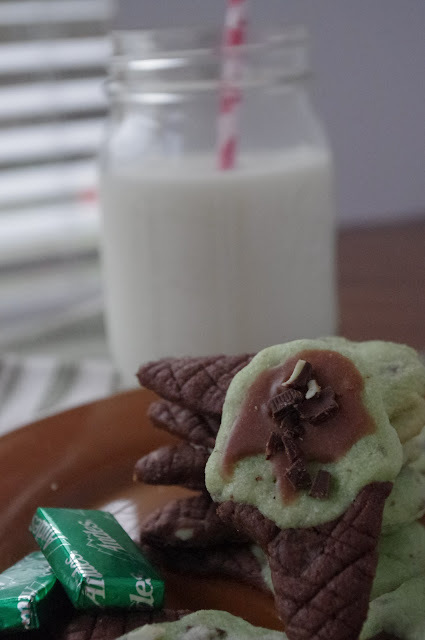 Mint chocolate chip is my favorite flavor (ok one of my many favorite flavors) of ice cream, so I thought I'd try and transform it into a cookie! They turned out pretty tasty, just a little more crispy than I personally would have liked but the taste was still great! I used the points on a large star cookie cutter to create the cone out of chocolate cookie dough. I used the flower petal edge of a flower cookie cutter to create an indent in the cone for the "scoop of ice cream" to sit in. I then took a little knife and carved criss-cross lines into the cone, to make it look like waffle cones! To make the ice cream portion, I used mint flavored dough with chocolate chunks mixed in. I used the flower cookie cutter to make the ice cream scoop. I then took the little middle part of my old fashioned biscuit cutter and rounded off the top of the "scoop" to look more like an ice cream cone. Then I placed the ice cream scoops on top of the cone, and pushed them together a little. Baked them, made a chocolate icing to put on top, and topped them with some chopped up Andes mints. 1/4 cup mini chocolate chips or Andes mints, chopped up. Sift together the flour, cocoa powder, baking powder and salt. Mix together the butter and sugar until light and fluffy. Mix in the egg and vanilla until thoroughly combined. Gradually add in the flour mixture in 2 or 3 batches, mixing well in between additions. Shape dough into a small disc, wrap in plastic wrap and chill for at least 2 hours, or overnight. Sift together the flour and salt. Mix together the butter and sugars, until light and fluffy. Mix in the egg and the peppermint extract until combined. Add in the flour mixture in gradually, in 2 or 3 additions, mixing well in between additions. Starting with just a few drops, add in food coloring until desired color is reached. Once chilled and firm, remove doughs and roll out onto a floured surface. Follow the pictured directions above using cookie cutters to cut cones out of the chocolate dough, and ice cream scoops out of the mint dough. Form cone and scoops into one cookie by gently pressing together. Preheat oven to 325 degrees. Line cookie sheets with parchment paper, place cookies on sheets and bake for about 15 minutes, until edges are firmed. Whisk together the sugar and milk. Stir in vanilla and peppermint extracts. Add the cocoa powder and stir until combined. If it's too thick, add more milk. If it's too thin, add some cornstarch*. *You can also add more sugar instead of cornstarch to help thicken, but I was afraid of making it too sweet, so I used cornstarch, which makes no difference in the taste, but is a good thickener. Once icing is a thin enough consistency, put into a pastry/icing bag and spread onto baked cookies to look like "hot fudge" on the ice cream. Sprinkle with Andes mints pieces while icing is still wet. Wow, I love your cookie blog on the Cookie Swap. It was so much fun to connect with so many other food bloggers and you are right here in Nashville! Your cookies look very yummy and perfectly perfect for the holidays. I was so happy to see a fellow Nashvillian on my mail out list. 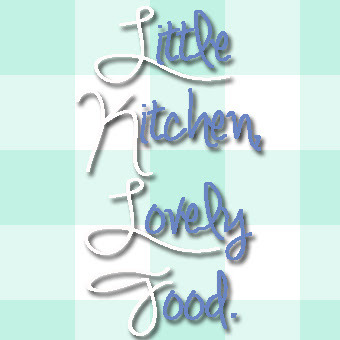 Bon Appetit.